The Lebanese Recipes Kitchen: Share home-style and healthy Lebanese recipes inspired by Lebanese family traditions from savory dishes to sweet. Enjoy the lifestyle of cooking authentic Lebanese food at your home kitchen. 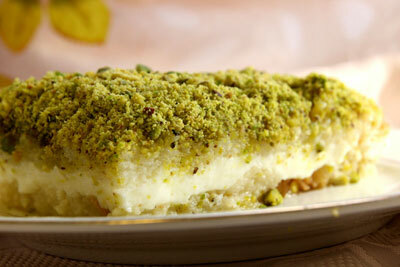 Lebanon is known for its delicious and mouthwatering desserts and this Aysh El Saraya (Aish El Saraya) is Beirut’s favorite. Extremely tasty and ideal for a quick yet appetizing sweet, this is only one of the approaches to making this Lebanese delight. Start your desert with the base, remove the hard edges of the sliced white bread and leave the core of the bread to fill the first layer of your Pyrex tray. Then start preparing the Sugar syrup, start it by boiling a cup of water with 2 cups of sugar stirring occasionally until it boils then add the lemon juice, blossom and rose water and use half of the syrup to cover the layer of bread until they are completely saturated with the syrup and leave the rest for the serving if desired. Now it’s time to prepare your second layer the cream mixture, very simple but needs stirring all the time, start by mixing the corn flour with the milk until the corn flour completely dissolves then add the sugar ,blossom water and rose water and stir at a low temperature until the mixture thickens you then put it aside and quickly add the whipping cream and don’t stop mixing until they combine then empty the mixture on top of the first layer of bread and syrup leave it to cool in the fridge for thirty minutes and then sprinkle the delicious pistachios. CORNSTARCH: is a starch made from grain and is used as a thickener. It is manufactured by soaking the whole maize grain, milling it coarsely to remove the germ and hull and grinding, sieving, and centrifuging the remainder to separate the seed proteins. The resulting starch is washed, dried and reground into a fine powder resulting in single granules. It does not contain fat or fibre. CORNMEAL: Cornmeal is used to make cornbread, muffins and other baked and fried foods that include some wheat flour and leavening. It is made from ground corn. There are different grinds. CORN FLOUR: Cornflour is used to flavor baked goods and adds nutrition. It is gluten and wheat-free. It’s the finest grade of cornmeal. Made from flour corns, it contains very little protein and is practically pure starch, making it a good thickener. It also contains fat and fibre, while cornstarch does not.